Asppice Engineering can avail from us a wide assortment of HT Motor Cast Aluminum Cooling Fan.The products offered by us are available in various sizes and colors that can be customized as per the requirements of the clients. One can avail from us a quality approved assortment of HT Motor Cast Aluminum Cooling Fan. Moreover, our products are available in the market at industry leading prices. We offer our client an excellent quality range of PP/Alu/Cast Iron Fans, which are manufactured from high grade quality raw materials. These PP/Alu/Cast Iron Fans can be customized as per our precious customers specifications. These PP/Alu/Cast Iron Fans are widely known for its durability and quality. 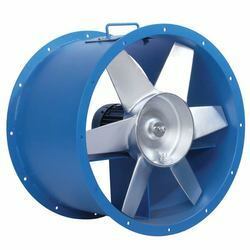 Our PP/Alu/Cast Iron Fans can be availed at industrial leading price. It is designed to Exaugh air form tunnel through pipe line, we manufacture all types & all sizes of exaug fan, the blades are casted from Alluminium to achieve higher dia with lower weight, which is mechanically attached with Electic motor of 10 H.P, 15 H.P or above it depends on size of fan. Our organization is known for Manufacturing Diesel Engine Aluminium Fan of 76 mm bore & 1066 mm length. These fans are appreciated for their corrosion resistance, longer service life and low maintenance. Further, these fans are used as a diesel fan in heavy diesel generators in various industries such as automobile, mechanical and others. These load limiting type fans are aerofoil design. The blades are made from cast aluminum. The adjustable pitched impeller provides many desired pitch angles. The number of impellers can be changed to suit particular fan characteristics. The hubs are machined Mild steel or Aluminum. specially designed with aluminum alloy body, having well balanced pressure die-cast rotors are manufactured by us and directly coupled with the blower casing. Wheel diameters : 24" to 72"
Static pressure to : 1.5" w.g. We are one of the Largest Manufacturer of Aluminium Cooling Fan in india.We manufacture Cooling Fan for various type of Electric Motor cooling fans as per the buyers specification / Drawings. We manufacture and offer aluminum cooling fan for motor as per drawing /sample. This is id-34 mm , OD-225 mm for remin make motor. With prosperous industry practice, our entity has gained huge appreciation in the market by presenting FRP Fan to our respected patrons. We are a reputed entity, engaged in offering a qualitative array of Aluminium Fan Assembly.